Our product range includes a wide range of whey separator. 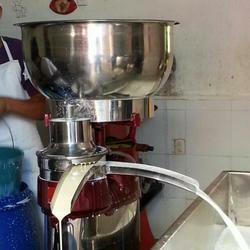 Whey skimming separators are used for the skimming of whey, which accrues during the production of cheese, i. e. the continuous discharge of the whey cream with concurrent cleaning of both separate liquid phases. The solid, which also contained in the raw whey (more aluminous whey dust) is concentrated in the solids tank of the bowl and discharged discontinuously. Looking for Whey Separator ?